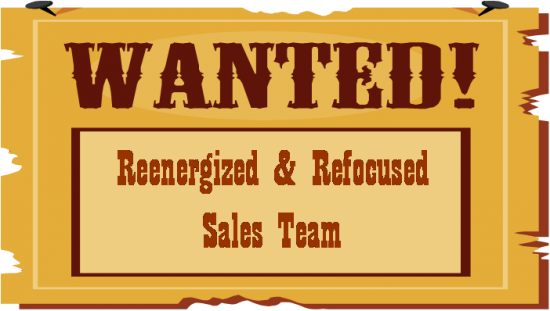 As we emerge from this economic “nuclear winter,” we are finding many of our clients are searching for ways to reenergize and refocus their sales teams. This economic “nuclear winter” has taken its toll on many companies and has shaken the confidence of many sales professionals. Cold sales have produced chilled sales associates. With the slow, but in process, economic thaw, it is time to reignite your sales team. As the economy continues to warm up, those companies that prepare their sales teams will be in the best position to take advantage of whatever rebound means today. OK, I can’t keep the weather metaphors going, but you get the picture. It is time to invest in your sales team and get them reengaged and ready. Are they meeting your sales goals? Are they leaving business (MONEY) on the table? 1. Invest in a lot of advertising without also investing in your sales team. I am always amazed when retailers spend thousands of dollars on advertising to drive consumers into their stores (or call centers); yet, when you visit the store the sales person is clueless on how to close the sale. 2. Create sales reward campaigns that solicit the wrong behavior. The buyer can easily spot when programs get in the way of sales and customer service. It generally results in buyer confusion and pullback. 3. Cap sales incentives or commission programs. Restricting programs create timing games that can hurt the business and impact customer service, or de-incent the sales team. 4. Hire sales associates that don’t have the right performance or behavioral strengths to sell your products or services in your market. You most likely have a unique sales associate need, so make sure you know what that is so that you put people in position where they can succeed, not fail. Here are some quick and easy “do’s” that will get your team both reenergized and refocused. Measure where your associates need the most assistance in the sales process. Use a good and valid diagnostic tool that provides reliable data to determine the gaps – don’t just guess; this is an investment that will create a great return if you are truly addressing the right gaps. Do they know how to Open the conversation with a buyer? How well do they Investigate the buyer’s needs? Do they rush or ignore this step? How well do they Present the solution? Do they tie your product or service to the needs found during investigation? Do they Confirm the sale? Gain agreement. Ask for the business? Deal with objections effectively? How strong are they at Positioning your company for future business or other opportunities? Provide training for your sales associates that focuses on their gaps, but also refreshes all the elements of the sales process. The whole sales process is inextricably intertwined and should not be separated. Leverage your top sales performers in the training. The training should also take advantage of what your top performers do so that others benefit from that knowledge. Train your sales managers on effective coaching. They should attend the sales associates training and then receive additional training to learn how to coach better and to drive results based on understanding the sales associate’s gaps, behavior styles, motivations, drives, etc. Even in a hot market, keeping your sales team inspired and alert to opportunities can be a challenge; but in a cold, or now a thawing market, it is downright exhausting. Your sales executives are looking for approaches that can help them. 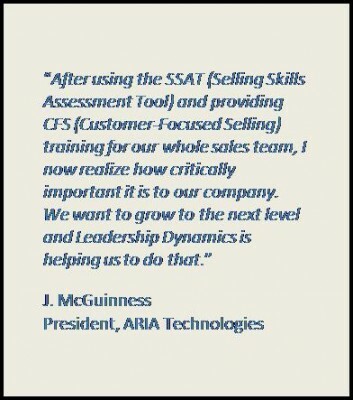 Leadership Dynamics has the process and diagnostic tools to identify sales knowledge and behavioral fit; and we can provide customized sales training that is proven and gets results. contact me directly at either dchandler@leaders-inc.com or 1-855-831-9100.